Margaret-I did some ‘free lunging’ in “Stacy’s Video Diary: Jac- Episode 14”. The lunging that most people speak against is done just to wear the horse out. 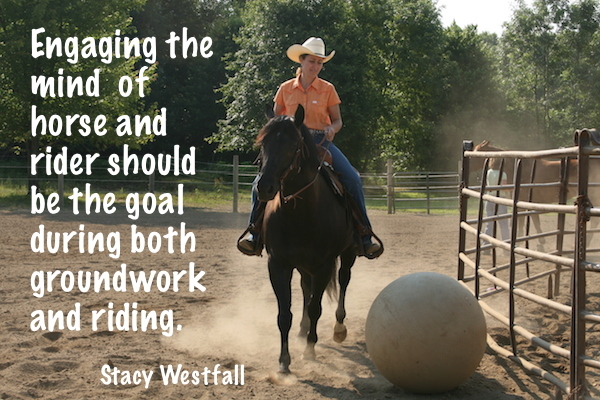 Some people lunge with the goal of making the horse physically tired NOT with the goal of engaging their brain. Lunging to make them physically tired, just loping them in circles, can and is done both on line and off. The rope or lack of rope doesn’t determine the goal- the human does. When I was in college students had the opportunity to go to the Quarter Horse Congress to work hands on with trainers. Many of my friends and myself were hired to lunge horses only for the purpose of making them tired. Not something I am proud of. You can still see it being done if you visit the show. 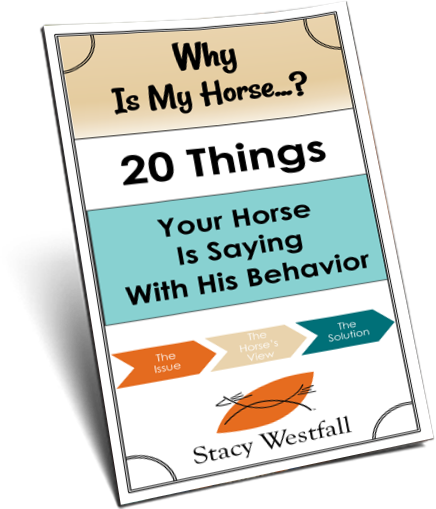 Engaging the brain doesn’t necessarily mean that the horse must be ‘free lunged’ or loose it just means that I am conversing with the horse the whole time. This is possible both on and off the line if done correctly. Many years later I showed Roxy at the Congress and Roxy gave me one of the biggest complements I have ever received. I took her in and showed her in a reining class on a ‘full drape’ which means the reins were very, very loose. She ran fast, stopped hard and we placed in the class. The huge complement that Roxy gave me came when I was leading her back to the stall. A big gust of wind came through and she started bucking and kicking up her heels, without pulling on the rope. It only lasted a few seconds but what she was telling me was that she was fresh and feeling good; AFTER I SHOWED. Which meant she hadn’t been exhausted to reach the goal, just well trained and willing when she could have easily chosen to act up. While it often looks like Jac is ‘just going in circles’ I try to verbally explain that more is happening than meets the eye. Jac may look away, drop in, try to stop, etc. and I deal with each as it comes. It is often easier to teach people to see these things through the use of objects or ‘games’ because the goals and visuals become more clear; even though engagement is possible in many other ways. I’m a Judge for the AKC Hunt Tests. We judge on horseback. I have a TWH that is very well behaved and now pretty calm (has to be with dogs running all around him and guns going off). He’s usually pretty frisky in the mornings with all the other horses around. I always lunge him a little to loosen up and get his mind in the game. Then a little flexing and yielding just to start thinking. When I get on he’s settled and is ready to play. If I lunged him to tire him, he wouldn’t be able to ride all day up and down hills like we usually do. I have seen three out of three young horses ruined for life, physically, through lunging. )Their mystery, permanent lameness would come a year later) Of course the lunger was not qualified, but everybody thought she was or he was. Poor owners. Very nice horses ruined. Circles are so hard on joints. I use a rectangle. )I m just an amateur owner.) The horse stays out of the corners because she is engaged. But she has straight lines, and literally 75% less stress on her joints with each step. She always passes the corners through engagement with me. My horse wants to be in the dance. Maybe I’m dumb, but when I lunged my horse it was to make sure she was warmed up a little, and not having any issues with her feet or legs. Took me all of about 5-7 minutes, and she went through all gaits both ways. I never thought to tire her that way. That would not be much of a partnership, in my opinion. What can i do to help coax my horse to Lunge he will go half way then refuse to keep going? Re-watch the first several episode of Jac (Episode 2, Episode 3, Episode 4) and see what I did to teach Jac to lunge. Hi, I was wondering how you deal with horses that are a little more stubborn. My filly has quite a bit of ‘sass’ and often does a bit of defying when I first start something new, or something we haven’t done in awhile. I know this must come down to lacking total respect, but how would you combat that ‘sass’ when it’s not all bad? Stumbled across your website yesterday evening & just finished watching all of your Jac videos. Love them, love them, love them. And then, Roxy’s complement really spoke to me. I’ve worked for cruel trainers in the past. Then, as a cutting horse loper, riding tooth-grinding-tail-wrenching 3 & 4 yr olds into the ground got to me & I got out of the industry. Haven’t even started a colt in over a year and I really miss working with horses. Your blog & videos are hugely inspiring to me — proof that the pursuit of God, the pursuit of excellence, and kindness to the horse aren’t mutually exclusive! Thank you for taking the time to do this!!! 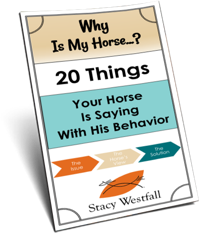 I recently had to move my horse from my own barn to a boarding stable. There is an indoor arena. what kind of ground work should I do with him? I’ve never had this situation before. You can always redo everything that you have seen me do with Jac! Review is key to success. I have been watching you and Jac, I love it and I thank you. My question is…I have a yearling that I am going to show in lunge line, how do I start her correct and not bore her from wanting to it in a class? I do Not want any holes in her training (which I have with my 8 yo Arab) so what would you suggest I do with her to do it correctly? Sorry my brain gets ahead of my fingers. I do not want her to get bored or hating the lunge line. I want her to enjoy it and perform at her best. Follow along with the Jac series and keep things interesting. Yearlings are tricker because their bones are not done growing so you need to be especially careful. I so totally agree with your description Stacy! Longeing is a wonderful tool and a ton can be accomplished. It should never be done just for the purpose of “wearing down” the horse. Awesome explanation! But how do you engage a horse while lunging. Sometimes I use trotting poles or a small jump or do different transitions. Is there something more I can do? To both work and train yet still make him use his brain. Karlien-Rewatching the Jac videos specifically focused on this question. You will see more than I can say easily. Maybe the best short answer is ‘keep things moving’. People go wrong when they get in a rut. You will see Jac ‘goes around’ me but every episode I am doing something new, different, engaging. Let me know if you see it or if you don’t. Especially if you don’t; please come with specific questions relating to an episode. Hi, thanks for the reply! I have been re-watching the episodes and I do see that you are doing new things while still making him go round you. I also saw that body language is important while driving him forward and how he responds to you, and one problem I have had i think i can now try and turn around. As it was me who was giving the wrong signal. (me stepping back and my gelding coming towards me). I dont have access to a round pen, but would working in different areas instead of always the arena be beneficial to my horse?